Art collectors who are fans of the show Lost might just have their dream come true with this just revealed art project planned for Art Basel Week in Miami. 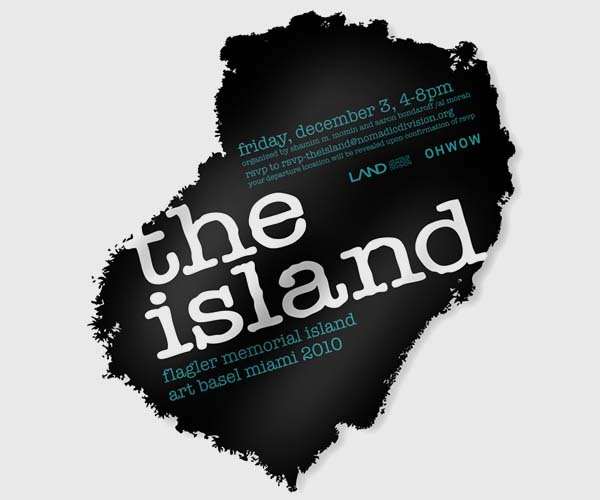 Aptly dubbed The Island, those lucky enough to attend will be whisked away by motorboat from docks at the Mondrian Hotel to Flagler Memorial Island in Biscayne Bay for a first of it’s kind beachfront exhibition and sculpture park. Organized by Shamim M. Momin of non-profit art organization Los Angeles Nomadic Division (LAND) together with Aaron Bondaroff and Al Moran from OHWOW, the Miami based gallery already responsible one of the most important group shows, It Ain’t Fair (teased), to coincide with Art Basel Miami Beach, the one night, site-specific event will include work from Terence Koh, Scott Campbell, Luis Gispert, Hanna Liden, Bozidar Brazda, Stefan Bruggemann, Brody Condon, Naomi Fisher, Michael Genovese, Adler Guerrier, Kate Levant & Michael E. Smith, Justin Lowe, Kori Newkirk, Jack Pierson, Marina Rosenfeld, Rona Yefman and others. With the final piece of red tape cut, the permits and logistics now in place, the excitement for this ambitious and truly unique exhibition can now build. Bring flip-flops and a free spirit, as they’ll be mandatory for this adventure. Categories: Art, Contemporary Art, Fairs, Shows & Events, Teasers. Tags: Adler Guerrier, Art Basel, Art Basel Week Miami 2010, Art Fairs, Bozidar Brazda, Brody Condon, Contemporary Art, Hanna Liden, Jack Pierson, Justin Lowe, Kate Levant & Michael E. Smith, Kori Newkirk, LAND, Los Angeles Nomadic Division, Luis Gispert, Marina Rosenfeld, Michael Genovese, Naomi Fisher, OHWOW, Rona Yefman, Scott Campbell, Shows & Events, Stefan Bruggemann, Teasers, Terence Koh.